CrossFit trainer Amy Cazin had no idea when she created her own all natural deodorant for her children that her business would take off the way it did. She didn’t want her daughter spraying or rubbing chemicals onto her body and her all natural deodorant, Primal Pit Paste, was the result. However, she had no clue that a year later her business would have taken off and that her deodorant would be available in stores nationwide. Originally the Cazin family produced the deodorant in their kitchen, printed labels locally at a print store and applied the labels themselves. However, they soon realized they needed to find a different solution for their labeling. After speaking with LabelValue.com representative Ross Ferlita, they determined that the best solution was digitally printed custom labels on a more durable BOPP material with a laminate coating. The laminate and BOPP material would help the labels to be far more resistant to smudging and water damage than their previous labels. 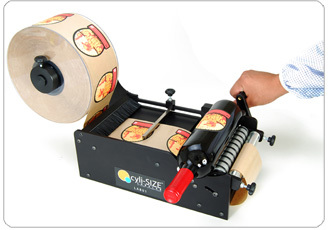 To solve the application problem and speed up the packaging process, Ferlita suggested a label applicator that could be used to quickly apply labels to all of their containers, down to the very smallest. This would speed up their label application process significantly while still enabling them to handle it in house. This was the perfect scalable solution for their rapidly growing business. Businesses in the food industry face this problem the most often, as a small product line quickly catches fire and becomes an overnight success. That's why we recommend that businesses looking to apply their food labels more quickly make the small investment in a label applicator. It will pay huge dividends as your company grows. How many custom food labels should I buy?